Marijan Zivkovic’s Band. A Roma band which has played traditional Roma music together for four years at numerous events in Croatia. Driven out by anti-Roma violence and discrimination in Europe, various members of the band have come together again to play in Montreal, as they wait for status. 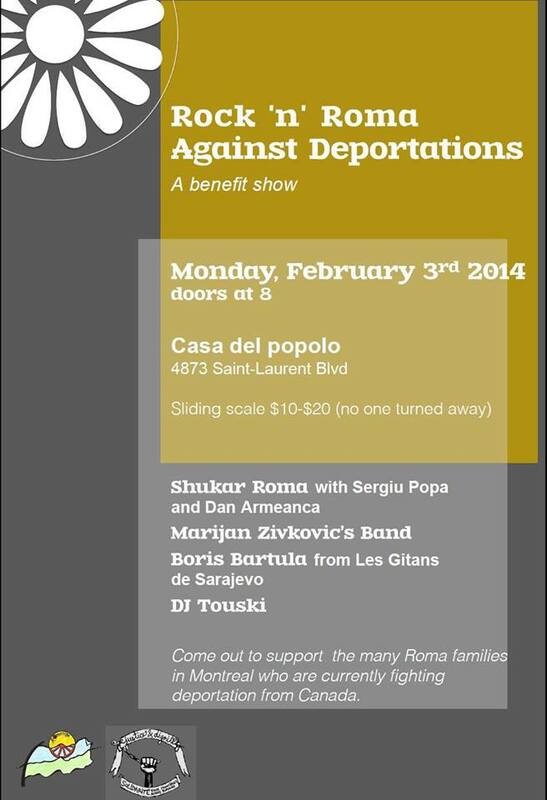 Come out to support the many Roma families in Montreal who are currently fighting deportation from Canada. Neo-Nazi movements in Europe are openly targeting Roma with the complicity of state authorities. Right-wing militias have marched in uniform through Roma areas, houses have been fire-bombed, children and adults have been killed. Authorities have conducted violent, forced expulsions. This overt violence builds on centuries of racism against Roma throughout Europe; economic and social exclusion that has locked Roma communities into poverty. Many Roma have chosen to leave the region entirely, seeking better lives for themselves and their children in Canada. But, in a move reminiscent of the ‘none is too many’ attitude that closed the door on Jewish refugees fleeing European Nazi movements earlier in the century, Canada has turned its back on these families. Former Immigration Minister Jason Kenney declared that Roma were “bogus refugees.” Evoking negative stereotypes, he used Roma as scapegoats to gather support for his plan to dismantle Canada’s refugee system in favour of a market-driven immigration. In Hungary, he launched a billboard campaign to deter Roma from coming to Canada–sparking a new wave of racism against Roma in that country. The benefit will support the struggles of several Montreal Roma families to stay in Canada.